Have an expert come do the job with the appropriate equipment necessary for a meticulously cleaned dryer vent. Once the job is complete the technician looks into the vent to make sure nothing was missed. Having this service performed will help maintain your dryer, keep the warranty in tact, lower your utility bills and give you peace of mind that your family and belongings are protected. 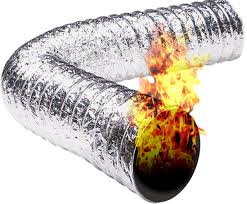 Get you Dryer Vent Cleaning services every 6 months to a year to avoid a home or business fire!! Most people do not think about Dryer Vents causing house fires. Well think again.When dryer vents are not maintained properly or not cleaned when it’s time, you are at risk for a fire originating in the dryer vent. Lint and debris not caught by the dryer screen will build up over time which in turn obstructs the hose. This can cause insufficient air flow and with dryer exhaust backing up can initiate a fire hazard. The build up can also cause other dryer issues. These issues can be musty or mold odors on clothing or after the drying cycle has completed, longer drying times and unusually hot clothing once drying cycle has finished. Other signs that you dryer vents are in need of cleaning are burnt smells in the area of the dryer, clothing not drying properly and it can cause dryer parts to stop working. We all know that extended drying times mean higher electric or gas bills and if the dryer stops working you have to pay for it to be repaired. Dryer Vent Cleaning Service can prevent all of these issues.